In the morning we can go to the colorful market of Ruteng. After that we we drive up to Ranamese Lake. We make a stop here to have a look over this mysterious lake. Half an hour before Bajawa, in Aimere, we can see how the local people make their traditional palm wine (Arak). We continue to Bajawa and have lunch there. After lunch we go to visit the relatively new volcano (Wawo Muda) with his colored lakes. This volcano erupted in January 2001 and the scenery is still fascinating. The trekking to the craters will take around three hours go and back. And as a nice ending of the day we go and relax in the hot springs of So’a. We go back to Bajawa where we spend the night. After breakfast we go to the traditional village Bena. After that we continue our trip to Ende. Just before entering the city of Ende we visit the Blue Stone Beach. On this beach and in the surroundings you can find the nice shaped blue stones. In Ende we have lunch. In the afternoon we drive up to Moni to find accommodation for the night. After dinner there is time to see the traditional dance of Moni/Ende. 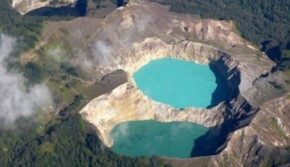 Very early in the morning we drive up to Kelimutu to see the three colored lake at sunrise. Here we walk up to a viewpoint and have a spectacular view over the three lakes. Then there is the possibility to hike down (one and a half hour) to Moni or go back with the minibus and have breakfast in the hotel. In the afternoon we visit Wolowaru with its traditional kings house. After that we drive to Maumere and on the way we can have a stop at Paga beach for a drink. In Maumere we bring you to your hotel where our trip ends.